If you tend to sit for longer than 2 hours during the day or are otherwise prone to back pain and aches, today’s stretching routine makes a lot of sense. Some of the symptoms of prolonged sitting are reduced spinal flexibility and fragile back muscles, and ignoring them can lead to bad posture and increased risk of spinal injury – not to mention chronic back pain. The movement of the spine is a complex process. The spine is made up of 24 movable vertebrae in the neck (cervical), upper back (thoracic), and lower back (lumbar) that are joined by cartilage discs at their bodies and small gliding joints in their arches. Numerous ligaments and muscles connect the vertebrae. Weak muscles on your back do not have the strength to properly carry your body while you need their flexibility for most daily activities. Today’s 5-minute routine combines several exercises that have proven their worth for back strengthening. You can also use these exercises to preserve and/or bring back mobility and flexibility of your vertebral column and stabilize the inter-vertebral discs’ fixation. The best part is that the routine is packed down into 5 minutes. 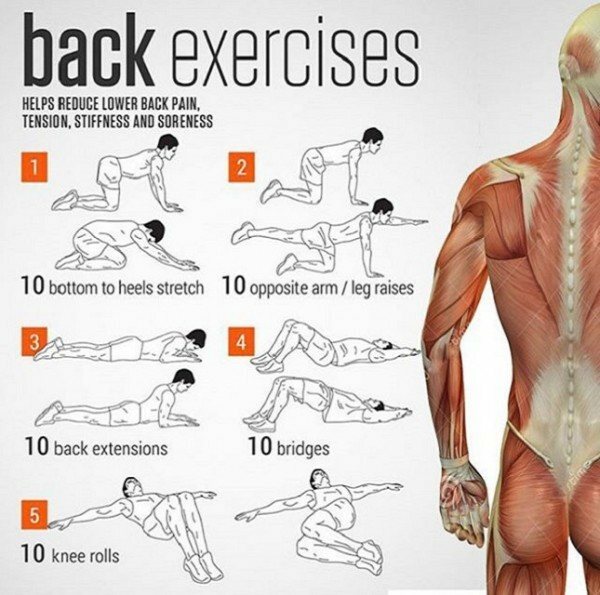 That’s just 5 minutes for a back that will be healthy for the rest of your life. You can start with 3 times per week and increase to 5-6 times per week. After that, if you want to further improve your spine and core condition, you can continue with our own series here, here and here.